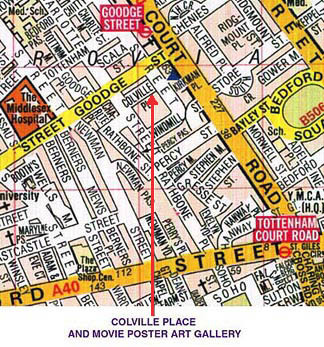 The Movie Poster Art Gallery, London: Directions, map, and opening times. 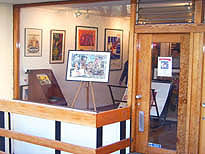 Movie Poster Art Gallery is situated at 1 Colville Place, London, W1T 2BG, in one of Central London's most beautiful and unusual streets. No.1 was architect-built in the 1960s and is a Grade II listed building, evocative of the period both inside and out. The ground floor space MPAG occupies was purpose built as a gallery and has remained so all along. Colville Place is minutes away from both Goodge Street and Tottenham Court Road tube stations, and is only 10 minutes walk from Oxford Circus.